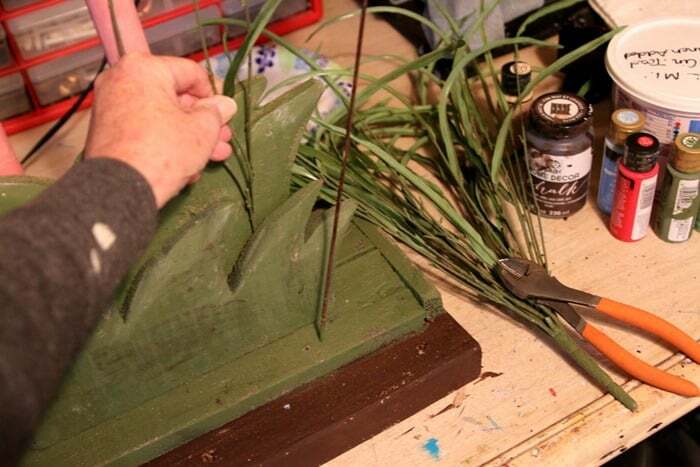 Want to know how to repaint outdoor decor? 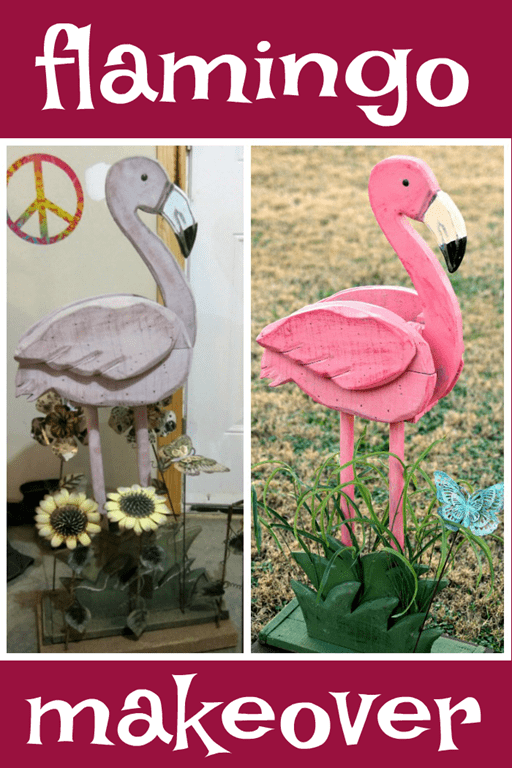 I’m sharing every single step of the repaint job on the wishy washy looking flamingo planter. When I spotted the pink flamingo planter online I knew I had to have it. I also knew it was going to get a makeover. 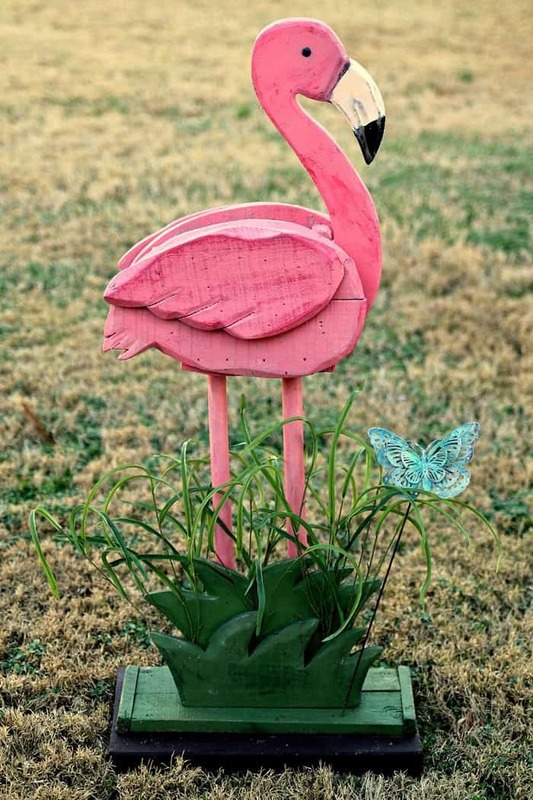 Bold paint and one simple addition took this cute flamingo to a whole ‘nother level. You guys know I have a thing for pink flamingos. I always liked them and I was definitely hooked after our years in Florida. 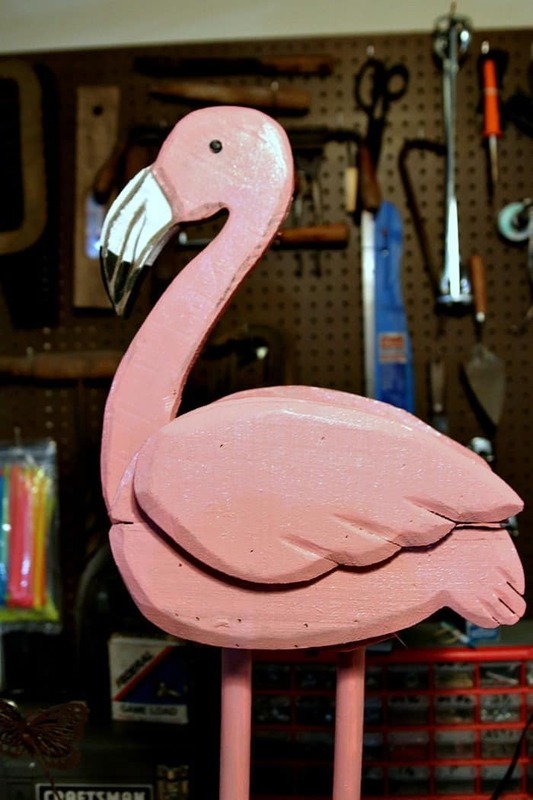 I don’t have any flamingo décor in the house now but when we lived in Florida I sure did. 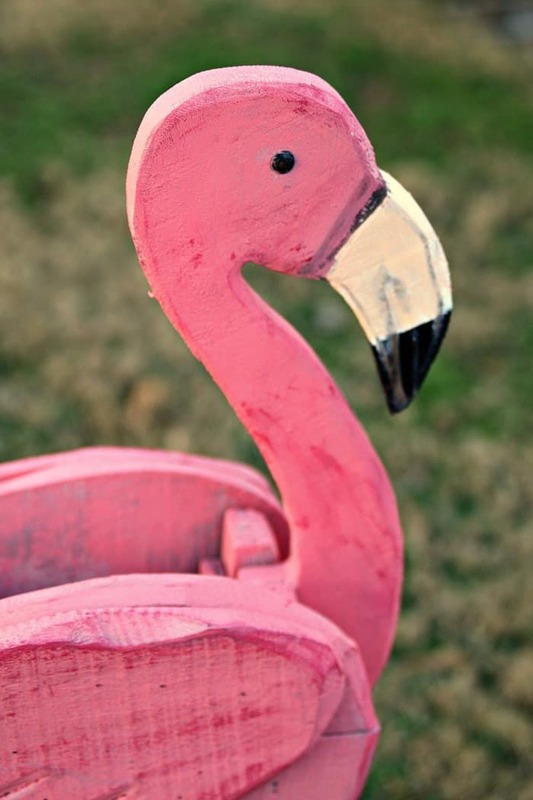 Flamingo décor should be bold and bright or that’s my thinking anyway. 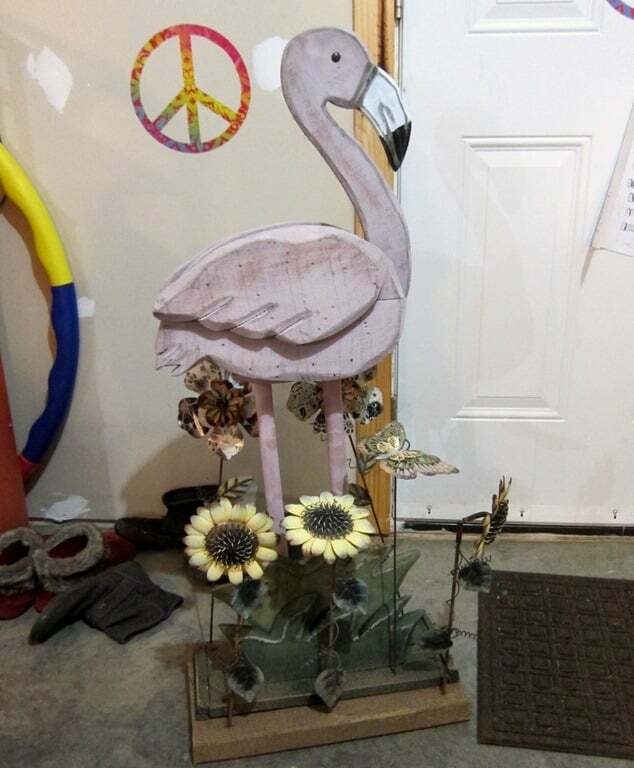 This flamingo was not bold and bright and I have to say the metal flowers were a bit tacky. Maybe tacky is not the right word or a nice description. I would just say the flowers are not my style. Well, I took care of that. Or I should say the JTS took care of that. I pulled out one of the metal flowers but couldn’t get the rest of them out of the stand. Too hard for me but not for hubby. I asked him to leave the metal butterfly. Next thing to do is paint the flamingo. I didn’t have the right paint color so I grabbed paints and started mixing. A pretty corally pink was the color I was going for. It took a few tries to get the color just right. I kept mixing the paint until it looked about right. The first color swatch on the neck of the flamingo was too light and the sample on the bottom is the color of the final mix. 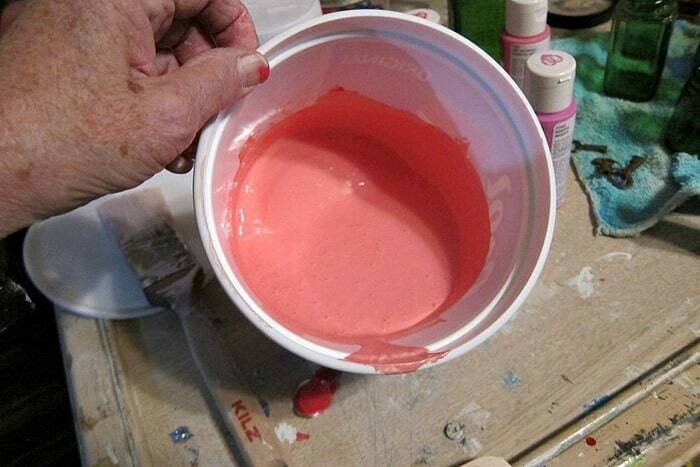 Don’t be afraid to mix paints to make your own custom colors. I try to use the paint I have before going out and buying more. 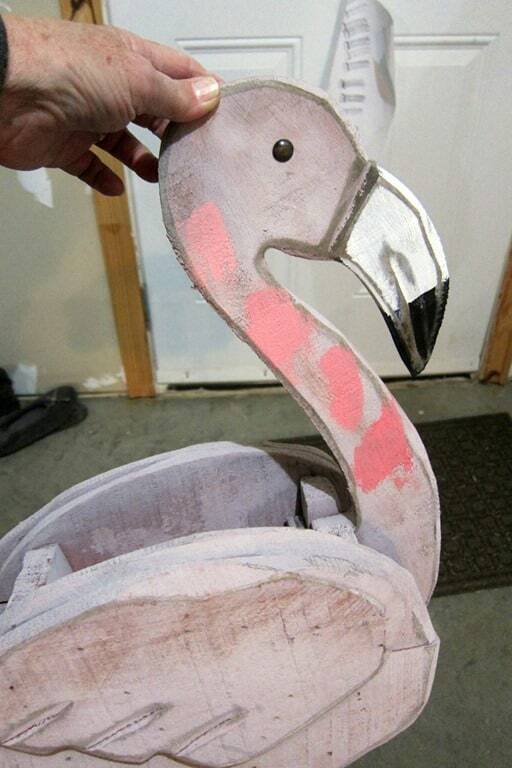 This is how the flamingo looked after one coat of the coral/pink paint. You can see it looks a little flat. After all it is just one paint color, no shading, no distressing, to break up the solid color paint. 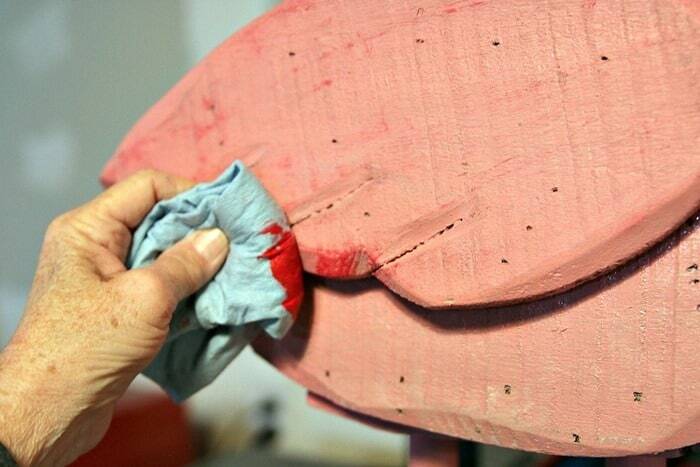 I grabbed a small bottle of red paint and started wiping it on the body of the flamingo with a paper shop towel. I rubbed and rubbed to blend the red in with the coral. On small areas of the lower half of the body I wiped a flesh colored paint for shading. 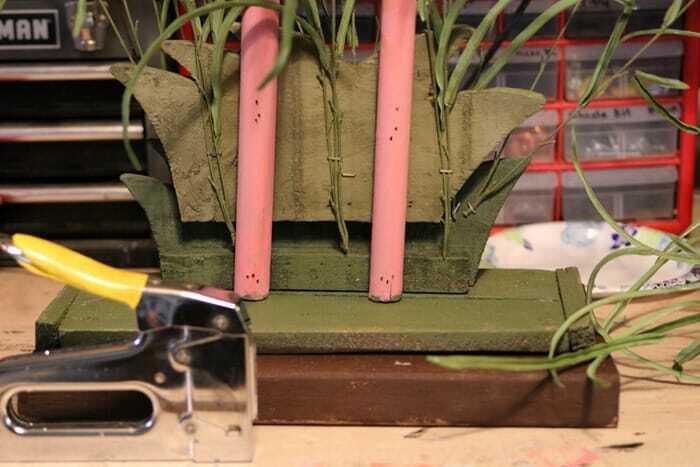 The base and the grass needed painting too. 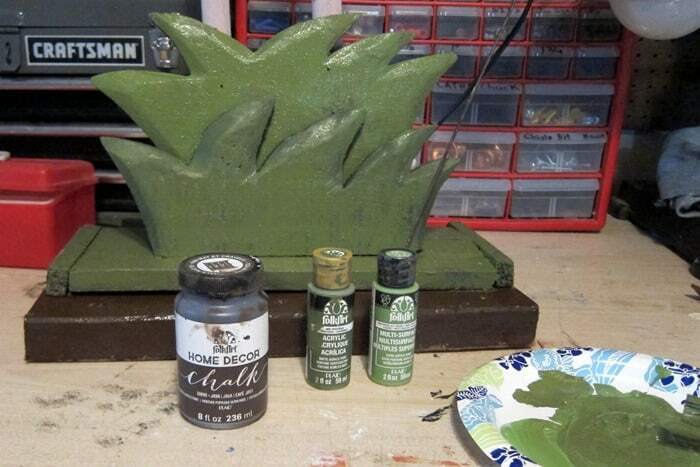 I also mixed two green paint colors together and did a bit of shading on the grass. 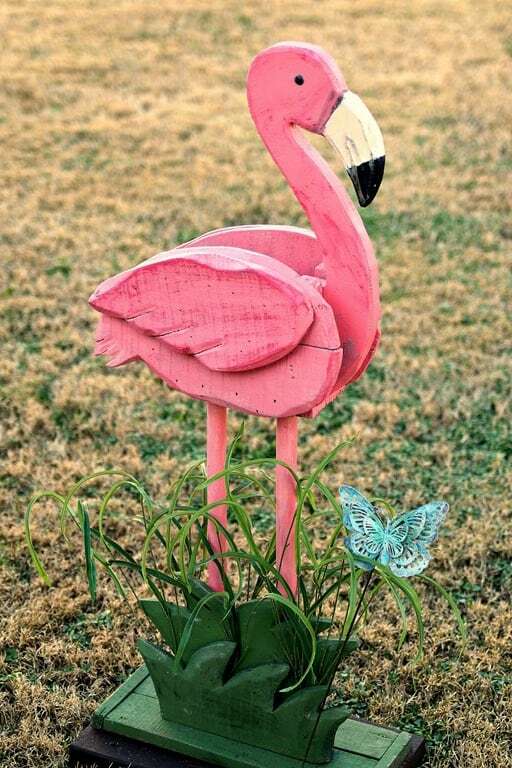 Now that flamingo looks a heck of a lot better. But it still needs something. It needs…..artificial greenery. This bush has been around longer than my kids…..and they are grown and have kids of their own. Seriously, I don’t know how old this thing is. 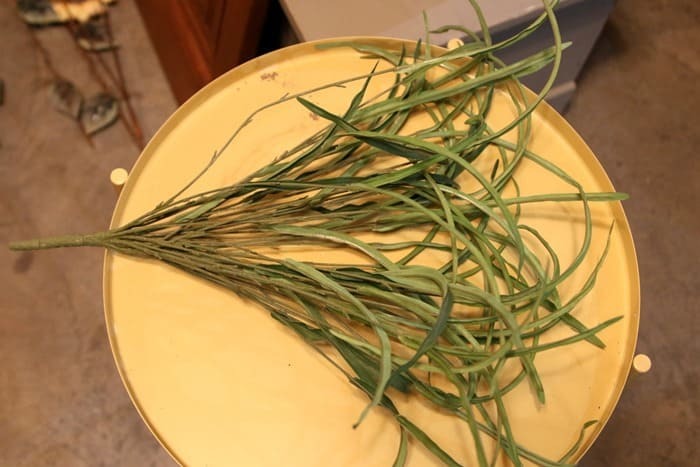 I cut pieces from the bush and stuck a few down into the crevasse between the two grass layers. There was just a bit of an opening so I had to figure out how to add more grass. I turned the pink flamingo around to the backside and stapled the artificial grass to the wood grass (insert Kathy smiley face). The top part of the beak was too white and I brushed a bit of soft flesh colored paint over the white. 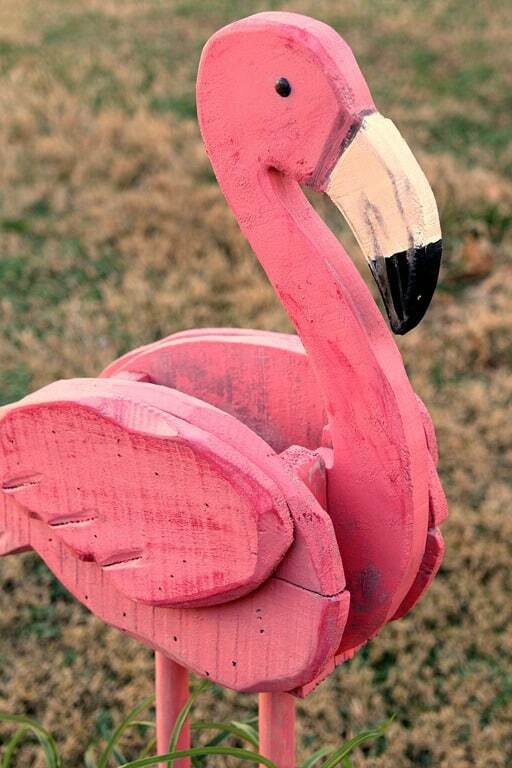 The flamingo legs got just a bit of flesh colored paint in areas to provide a bit of contrast. I updated the butterfly by dry brushing it with two shades of blue paint and leaving some of the original glitter finish showing. She’s a stunner now if I do say so myself. Come Spring I’ll be finding a pretty plant and moving the flamingo to the front porch. The flesh colored beak looks a lot better than the glaring white. I didn’t touch up the black paint at all. And the gray looking areas you see are the original distressed areas. That’s a major difference huh. Do you think I did good? What’s your favorite part of the makeover? 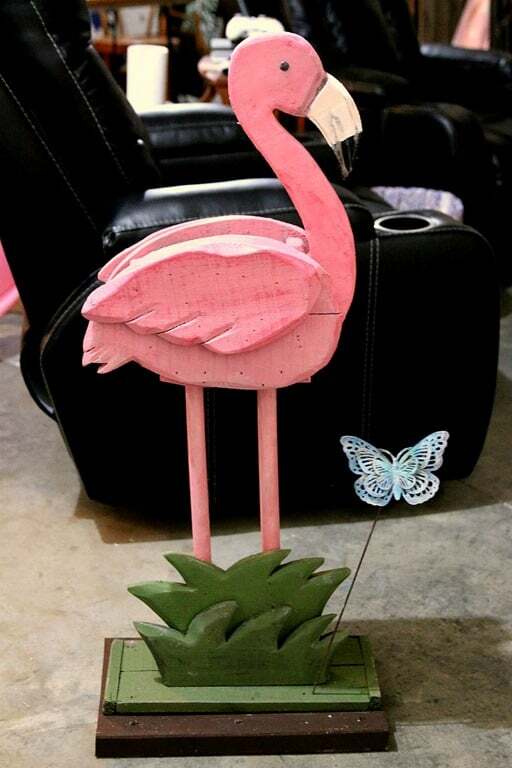 I really like your lovely flamingo! Very cute with her new colors! Now that Flamingo is happy. They should always be a beautiful shade of pink…and this one is. I live in SWFL. She is a super cute flamingo now Kathy! Love him (or her – how do you tell?) You are right about the flowers – too much and way too tacky. I love the shading with the red – I need to be bolder when painting outside items – I love shading/dry brushing on inside projects but for outside, my main concern is having the paint stand up to the weather. Thanks for all the projects you share with us. Love the look! So good. Turned out spectacular and the butterfly is perfect!! You find the greatest things-now I will be on the look out for a wood flamingo! Yours turned out great I am suffering from flamingo envy. I love flamingos and like your makeover so much that I think I’ll make my own out of wood. I have plenty of flamingo fabric to use as a pattern and old greenery too. Thanks!! Love it! Sooooooooooooooooooo much better. Great job on the shading. Wish I could find one like it. Jealous!! I love flamingos and I live in Florida now so it works for me to have them! Great job! I’ve always loved flamingos too, and yes, so much more after really seeing them in Florida! We got to see them up close and feed them in Sarasota. I was in heaven!! Pretty uninspiring before with those faded and tacky finishes. Now a very beautiful flamingo and cleverly not overdone – the bits you left are what makes it. It’s eye catching for all the right reasons.